We are currently in the process of updating our website, which will show our new location and some updated information on our rides, family members, etc. Please note that we do not have beach access on the new property, but instead we have 400 acres of beautiful fairytale jungle with endless trails, sinkholes and amazing wildlife just for the Rancho Baaxal Family. While we are getting our new website done, we'll send you updated info by email. Our ranch is not like other ranches; it’s a pretty well-kept secret (that we are happy to share with those who do find us!) hidden in the jungle, in a rustic, ecological and natural environment. We have a few, but very important priorities. 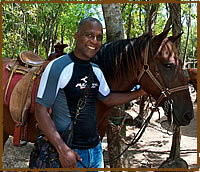 Number one is that our horses stay happy and healthy, and you, as our future or returning guests, are number two. We do not mean this in an offensive manner, but our horses’ well-being is not negotiable. “Baaxal” is a Mayan word meaning “a place to have fun” and we strongly believe that if our horses are happy and are having fun, so will you. Our family at Rancho Baaxal has a huge love and respect for animals and we use non-violent training methods and only positive reinforcement and communication with our horses. 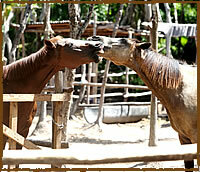 If you share our philosophy and love for nature, you are sure to enjoy time spent with our horses. As a bonus we’ll give you the opportunity to ride through rich, unspoiled tropical foliage and on Maroma Beach, ranked by the Travel Channel as one of the world’s Top Ten Most Beautiful Beaches four years in a row. Also exclusive at Rancho Baaxal is our Full Moon Tour - an adventure out of the ordinary where you will take a breathtaking ride through the moonlit jungle and beach! Get to know our family better! Click on The Family to see pictures and personality traits of each of our 12 beloved horses and our ranch dogs!